Special Notes: This route is nicely serviced so there is no need for on-route support... so we've reduced the fee to cover any food and drinks avalable at the finish. We will have 1 room at the Travelodge Saturday night for the group. The room will be used for checkin, showers (400k riders), and naps for those who need it. Bring your own towel! No towel, not shower. We encourage you to nap before attempting any driving, please! This is a "Favorite Route". The 400K route starts just north of the Willamette River and heads south into the Willamette Valley as far a McKenzie. The route is fairly flat, and in some locations, dead flat. Controls will be in Scio, Sweet Home, Mohawk Post, Harrisburg and Independance. 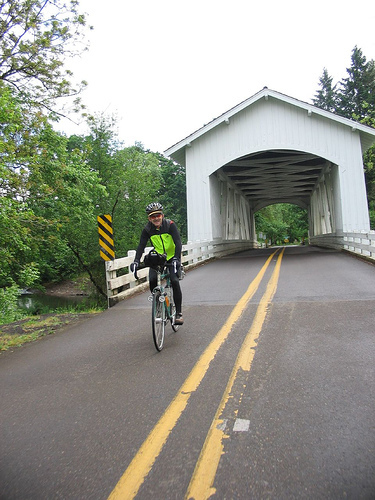 You'll see a 6 7 covered bridges, lots of farms, some forests and generally you're very close to the Willamette River. Pencil - There are lots of Info Controls that require you to write down an answer.